Does this make EIGHTY-FIVE acid attacks in London, in the last six months? Crime scene: Burdett Road was sealed off by police [Image: TFL]. And were the victims Muslims? Isn’t it time some sort of safety advice was available? Two people have been seriously injured in an acid attack in an east London street. 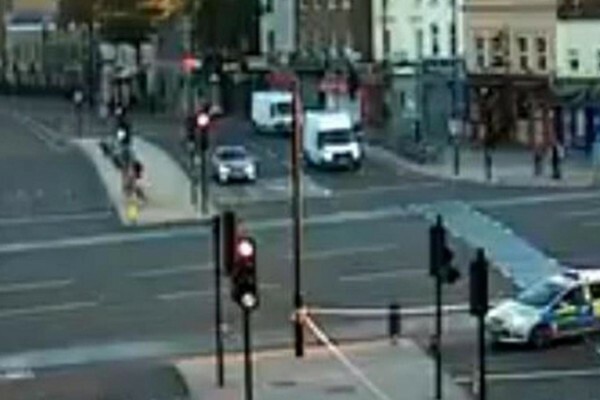 A woman, aged in her late 30s, and a man, in his early 20s, were left with serious burns after they were attacked in Mile End in the early hours of Tuesday morning. Scotland Yard said police were called to reports of an acid attack in Burdett Road shortly before 2.15am. The victims were taken to an east London hospital for their injuries after a corrosive substance was thrown over them. Their injuries are thought to be serious but non-life threatening. Burdett Road was sealed off and forensic officers were at the scene investigating for several hours. The Mile End area is a Muslim enclave, acid attacks are a Muslim import, check attacks in Pakistan, so if you’re looking for suspects it would be a good idea to start with the locals. Think again. The suspect in the attack on Resham Khan and Jameel Mukhtar is white, right-wing extremist, John Tomlin. If I was looking for a suspect, it would be someone like him. Last I heard, police were searching for Tomlin and hadn’t found him. Yes, by all means police should start by examining the area in which the attack took place. Take statements, get evidence. Then they should go where that evidence takes them – the grassy outer suburbs or wherever. That is how police investigations work. But you seem to be trying to implicate locally-resident Muslims, and that would be wrong. Something wrong with the ‘comment’ system…I made no allegations about who committed the crime I merely pointed out the facts of the location of the crime for those ignorant of London Oh, and as I pointed out in my last comment…Acid attacks are often personal. Girl says no get a acid thrown in her face etc. You said it happened in a “Muslim” area. I consider that to be trying to point blame at Muslims. I shan’t be publishing any more comments like that. Acid attacks are related to “honour” related attacks, it’s one step down from “Honour killings”. It’s horrifically easy to steal small quantities of strong acid from a school or industrial laboratory. In my day people came into the lab to scrounge small quantities of concentrated sulphuric acid to dilute to yield battery acid but of course we didn’t have the problem of throwing acid over people. A “caustic substance” could include caustic soda (sodium hydroxide NaOH) which is a strong alkali however it’s a solid that has to be dissolved in water. A strong alkali like caustic soda destroys the layer of protective fatty acid on our skin which then allows the material quickly attack the unprotected skin. That’s why dilute acids take a while to affect the skin – it’s because of that fatty layer. I personally think the retail sale of caustic soda should be controlled but it’s popular because it’s the best material to clear drains. I used it while etching printed circuits. Of all the strong acids fuming nitric is the one that would cause most damage in the shortest time, in my day that was stored in a locked cupboard because it’s so dangerous to leave a 2 litre Winchester on the bench.